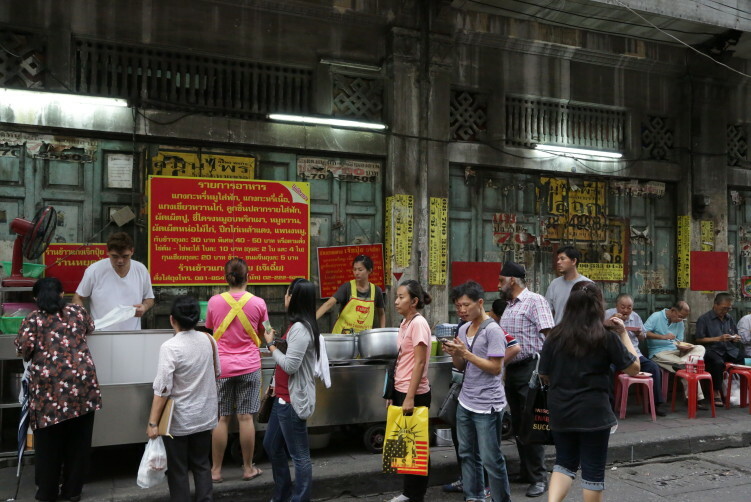 If you stroll along the beginning of Mangkorn Road, close to the famous Leng Noei Yi Temple in Chinatown, you will be surprised by a crowd of people queuing or sitting on small, red plastic chairs without a table. That’s Jek Pui and you should do as the locals, find yourself a red chair and dig in or get some take aways from the menu. 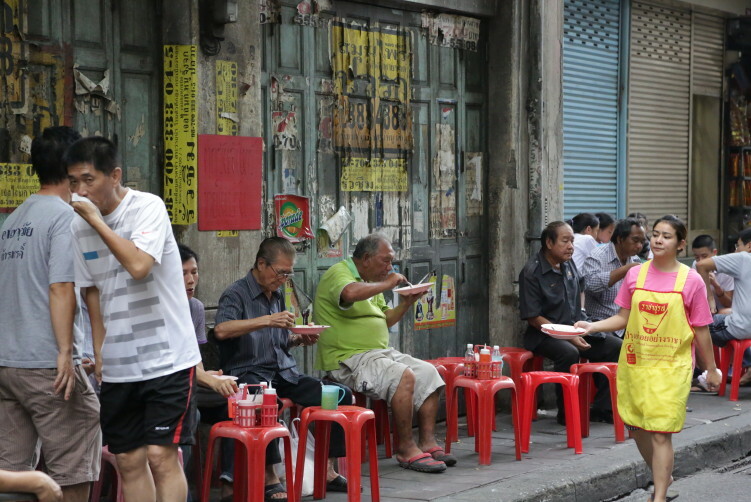 Jek Pui is a rather famous food stall that has been around for more than 50 years, established by the father of the current owner. Jek Pui has been on this corner since day one, so it’s also a rather unique and authentic view of how it was some decades ago. The biggest change is probably to replace the wooden chairs with the red plastic chairs some years ago. 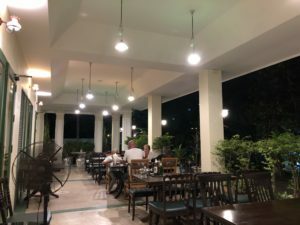 It’s a charming experience to sit there with your plate of yellow curry or something else from the khao kaeng menu in one hand, the fork in the other, your legs crossed and with a glass of rather week ice tea placed on the asphalt, bending down every time you want a sip. But it’s not only charming, the yellow curry is also excellent. For a long time I never thought that yellow curry powder (kaeng karii) could compete with freshly made currie pastes, but it sure can. Another thing to note is that it has a mild taste and isn’t spicy as the more common green or red curry paste dishes. The kaeng karii neua (beef curry) at jek Pui is creamy both in texture and flavor. And you make it a bit more lively by adding sliced chilies (phrik chii faa) in soy sauce and kun chiang, a kind of waxy deep fried Chinese sausage. Not only do they have a unique style of on-street eating, but the food is also very affordable price wise. The combination of quality and a staring price of 40 bath is not something you see to often, even in Bangkok. At Jek Pui you seldom see any left offers. Don’t get pulled of by the cue as that’s for take away. Find a chair and squeeze in with the crowd and they will approach you. You might need to come with the lady to point out your choice, but normally not. It’s a matter of seconds before you are served. A plate of green curry with homemade fish balls over rice can be an alternative for your kaeng karii, but with a preference for the last. That’s probably also what the people around you eat as well. How to get there: Take MRT (metro) to Hua Lamphong and walk from there. You can also take the Chao Phraya Express Boat to Ratchawong pier. You can take the express boat from Tha Tian pier or Tha Chang pier near the Grand Palace, or from Sathon pier near Silom area. Close to the famous Leng Noei Yi Temple in Chinatown. 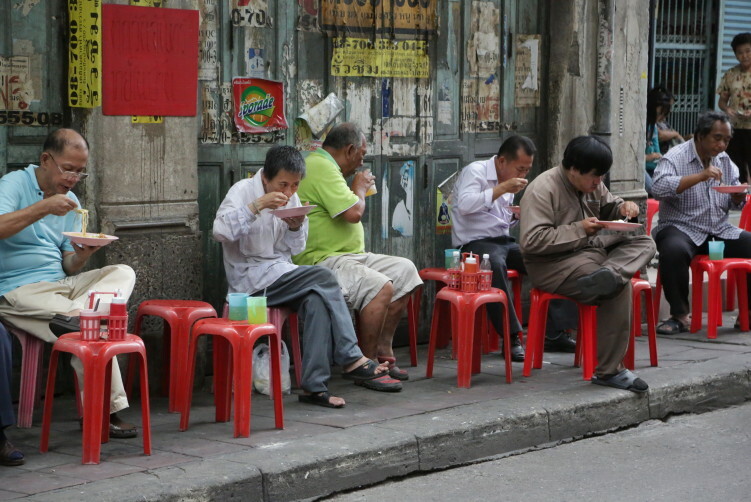 A crowd of people queuing or sitting on small, red plastic chairs without a table - that's Jek Pui. Do as the locals, find yourself a red chair and dig in or get some take aways from the menu. See full review at StreetsideBangkok.